With the mysterious and charismatic Rev. 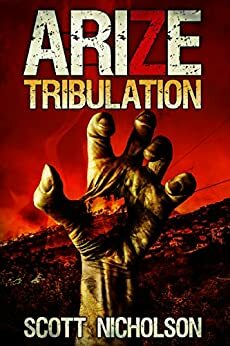 Cameron Ingram rising as a world leader in the wake of a zombie outbreak, a group of outcast survivors vow to bring him down. Ingram has formed an oppressive new government and demands loyalty from all refugees who seek protection. Those who refuse to wear his mark are considered enemies and left to fend for themselves. Ingram uses the military to expand his influence while he gathers a corrupt inner circle at Promiseland, the megachurch complex that offers sanctuary in a ruined city. After proclaiming himself a messenger of God, Ingram drops all pretense and embraces his role as the Antichrist. Dr. Meg Perriman and her allies plan to infiltrate Promiseland and expose him, but first they must traverse a hostile wasteland and evade Ingram’s deadly army. And they soon discover it’s not so easy to kill a king, especially one that’s no longer human. Scott Nicholson is author of more than 30 thrillers, including the After and Next post-apocalyptic thriller series, Stoker Award finalist The Red Church, and The Home. His books have been translated into ten languages and sold more than 800,000 copies worldwide. He lives in the Blue Ridge Mountains of North Carolina.